It may look amusing and easily dismissed as a novelty prototype many years from production, but take a good look at a technology that in a few short years is going to transform your life and have major implications for your business. 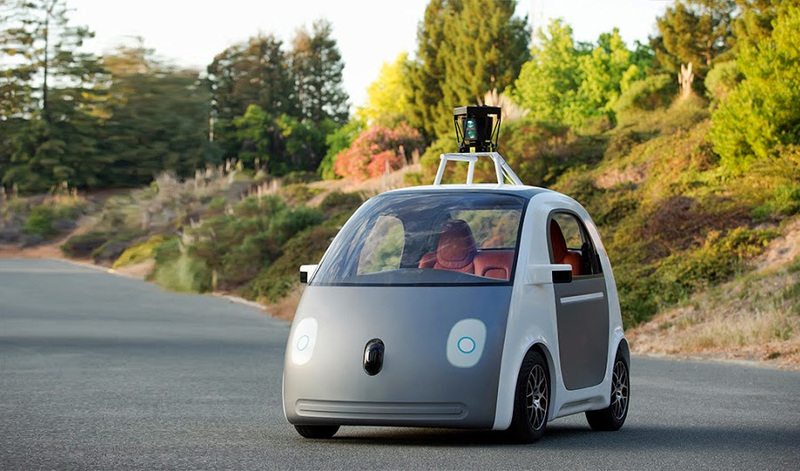 Last month Google officially announced at the inaugural Code conference that they have built their very own prototype self-driving car. It is designed to be used in urban settings at up to 25mph. It has foam bumpers and an electric motor and, for now at least, the Google signature spinning LiDAR on top. But what really sets it apart is what it doesn’t have: no steering wheel, accelerator nor brake pedal. A video of the car was also posted on the official Google blog, that included some sample riders from the key demographics that will benefit the most from this technology: disabled (Steve Mahan, star of a previous video and 95% blind), some seniors and a mom and her son. The reason that this is such a big deal for your business is because the simple fact that a car can drive itself is going to change how and where we all live and work. The vehicle can dynamically position itself to the point of need and then do work by moving people or goods to where we instruct. We will have a limitless supply of on-demand chauffeurs, or fully automated taxis if you prefer. We therefore don’t really need to own a vehicle anymore if we don’t want to; or even own several as the automaker’s business model would prefer. Rather than have our multi-purpose vehicle sit idle some 90% of the day, we can hire a vehicle suitable for our need; a shared self-driving electric 2-seater for our commute (and work on the way); an SUV for the group trip at the weekend. Some will prefer to live further from the city as the commute can now become part of their working day. Some will find it even easier to live in the urban center as they need never own a car again. Sprawl and urban densification at the same time; that will create enormous money flows from many existing business models to new business models. The impacts on land values alone could be transformative. A few offices will go mobile as rents and overhead costs in the city mean that some prefer the efficiencies and benefits of travelling between job-sites or appointments in their self-driving office. Have you considered a pimped-out self-driving RV as part of your retirement plan? Travel North America like a snow-bird moving from region to region with the weather and enjoying the company of your like-minded itinerant community. Some will find their jobs start to change or even disappear such as professional drivers (taxi, truck, bus etc), auto-body repair, auto-insurance, road safety professionals, transportation planners etc. For some new jobs will appear as new business models spring up overnight. This novel technology will be the catalyst for so many new societal interactions and services. Retail outlets will discover just how useful and cheap self-driving vehicle logistics are. When the vehicles are re-positioning for the morning peak hour they will be able to carry shopping to our homes in journeys that the empty vehicles would have done anyway. You will be able to use social media to profile the characteristics of your ride-share partner for your planned journey, as it’s a great way to cut costs and make new friends. You could even use the new self-driving ‘match’ service, and if the morning drive goes well you can go out on a date later that evening. The hospitality industry will forever be in debt to this technology if it means more people are willing to get out for the evening and have a good time because they are less concerned about how they will get home. If you are having problems finding workers then you will be pleased to know that self-driving vehicles will greatly improve access to your business premises. Some that are disabled, too poor, without a driving license, unable to drive etc. will now find it that much easier to hold down a job. If you are making medium and long term plans for your business then please consider how self-driving vehicles might impact on them. For instance, if you are going to commit billions of dollars to some major transportation infrastructure then you might want to do some due diligence, as the optimal project design could look very different in ten years time when self-driving cars are in the midst of transforming society. At a more mundane level, if you are expanding your business and wondering how you are going to accommodate all that extra parking in the future, then perhaps you may not need to. Morgan Stanley are certainly encouraging us to take this technology seriously. They estimate that the US could save $1.3 trillion/year when self-driving vehicles are fully deployed; that is nearly 8% of the US GDP in 2012. To misquote the British military 7P’s adage: Your proper prior planning for the implications of self-driving vehicles will help prevent poor performance; and is very prudent. From collating all of the recent statements from the automakers and developers there is a very high level of confidence that fully self-driving cars will be on our roads by 2025 at the very latest. Mercedes, Nissan and Volvo are all indicating a high level of autonomy by 2020, and Google have indicated their aspiration to have their technology in public hands in various possible forms sometime between 2015 and 2019. Warren’s not laughing, and neither should you be.